It seems I’ve finally entered the 21st century. Despite my affinity for fountain pens, slow flying airplanes, and traditional story-telling, I have relented and a Facebook author page is now available. This is a good thing because many of you are on Facebook and it will be very convenient to find The Bent Page, my YouTube videos, my website, and the latest about my books. You’ll also see a steady stream of updates on what I’ve been doing (getting in trouble) lately. 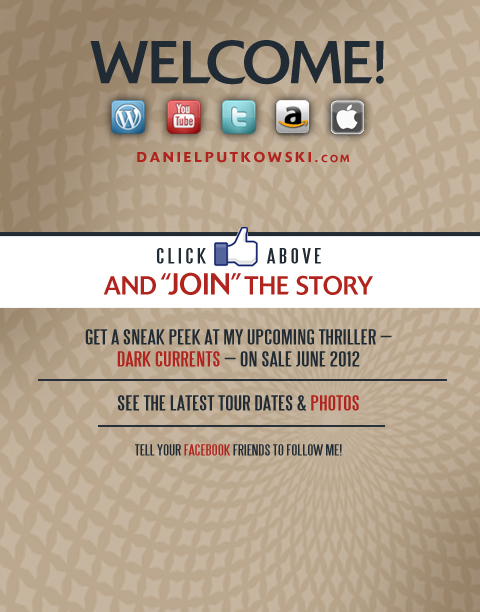 When you click on the thumbs-up “like” button, you’ll be taken to my page with an update on the new book, Dark Currents. Alternatively, you can search for Daniel Putkowski, and my page should pop up. I’m looking forward to connecting with more people in this newfangled way. All the best, and happy reading! Welcome to The Bent Page! Welcome to The Bent Page, a blog about reading, writing, and the world around us. My motto is, “It’s a small world but big enough for me.” One way in which our world expands and contracts is through the written word. It may be a blog, a book, a newspaper, or a note left on the fridge. The macro and micro world come into focus from far away or in the palm of your hand. The written word has been around for several thousand years, and despite great effort, has yet to be perfected. It’s a work in progress, one I happen to enjoy. And that’s why I started this blog, to give an outlet to some of my creative writing endeavors. Hopefully they’ll pique your interest enough to open a dialog, which is one of the best features of a blog. Ideas can be exchanged from around the world through the convenience of cyberspace. For more information or to check out excerpts from my books An Island Away and Bonk’s Bar, check out my website www.danielputkowski.com. There’s also information there about book signings and other events.